Below is a summary of the Earthwise styles manufactured by Showcase Windows and Doors. Our frames are made with a rich, millwork look for an inviting appearance. You can also choose from a variety of sizes, frame colors and grid options to match your tastes and the design style of your home. These windows and doors are available from your local Showcase dealer for new construction, replacement and remodeling applications. In addition, our insulated glass system, our vinyl technology, and our premium weatherstripping help keep energy bills low. Glider windows open by sliding the operable sash toward the center of the window. 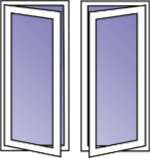 Our Earthwise custom-made windows have a gliding single or double pane (sometimes called a “lite”). These can be manufactured so that either the left or right sash is operable. Both casement and awning windows are hinged and open outward with a rotary crank handle. Casement windows open from the side while awning windows open at the bottom. Picture windows are stationary and cannot be opened. This is called a “fixed” window. Fixed windows are often used as a main feature, providing unobstructed views while allowing a large amount of natural light indoors. 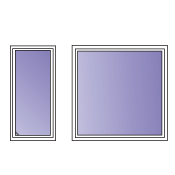 Picture windows can be used alone or in a grouping with other window styles. What’s the difference between a bay and a bow window? The bay window protrudes farther from a wall than a bow window, which is shaped in a gentle curve. The bay window creates more open space. The most popular configuration is a central fixed window flanked by two other windows, usually casement or double-hung styles which permit ventilation. Bow windows contain four or more windows. The windows join to form a gentle “bow” shape. 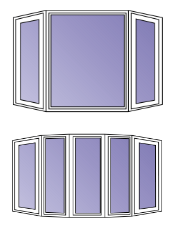 Similar to a bay configuration, the center bow of the window typically fixed while the side windows are operable. Our patio doors maximize light while providing thermal efficiency, security and ease-of-operation. Choose from a selection of distinctive colors, grid patterns and decorative hardware options. Showcase Windows and Doors builds Earthwise sliding glass doors with a millwork look which makes for an attractive finish to your home. These are available in 2, 3 and 4-panel configurations.